For other uses, see Linz (disambiguation). Linz (/ˈlɪnts/; Template:IPA-de; Czech: Linec) is the third-largest city of Austria and capital of the state of Upper Austria (German: Oberösterreich). It is located in the north centre of Austria, approximately Script error: No such module "convert". south of the Czech border, on both sides of the River Danube. The population of the city is 193,814, and that of the Greater Linz conurbation is about 271,000. In 2009 Linz, together with the Lithuanian capital Vilnius, was chosen as the European Capital of Culture. Since December 1, 2014 Linz is a member of the UNESCO Creative Cities (UCCN) network as a City of Media Arts. Cities receive this title for enriching the urban lifestyle through the sponsorship and successful integration of media art and involving society in these electronic art forms. Linz is well known for the Linzer torte, which is said to be the oldest cake in the world, with its first recipe dating from 1653. In addition to an ordnance depot, Linz has a benzol (oil) plant which was bombed during the Oil Campaign on 16 October 1944. What was once the Mauthausen-Gusen concentration camp is Script error: No such module "convert"., east of the city of Linz. The urban area includes (parts of) 13 other municipalities with together 271,000 inhabitants. Linz is also part of the Linz-Wels-Steyr metropolitan area of Upper Austria, home to around one third of the state's population (460,000 people) and second-largest urban area in Austria. The hotel business is equipped with 4.544 beds – 2.302 are located in the ten four star hotels of the city. Nine hotels have three stars and count 1.226 beds. The seven two and one star hotels are equipped with 472 beds. 544 beds are not categorized for commercial businesses. Five star hotels are not available. In 2004 Linz counted 647.428 nights’ stay. In 2013 the number increased to 775.396. 363.425 of the overnight stays were located in the four star hotels, 226.647 in the three star hotels, 67.593 in the two and one star hotels and 53.194 stays can be counted to other accommodation. 544 gastronomy businesses are located in the city. Germans are the most frequent guests, followed by Italians, Dutchmen, Swiss – the ranking is equal to the overnight stay ranking. Linz is one of the main economic centers of Austria. The Voestalpine AG is a large steel concern (founded as the "Hermann-Göring-Werke" during the Second World War), which is known for the LD- ("Linz-Donawitz") procedure for the production of steel. The former "Chemie Linz" chemical group has been split up into several companies. These companies have made Linz one of Austria's most important economic centres. Linz serves as an important transport hub for the region of both Upper Austria and, to a lesser degree, southern Bohemia. The "Blue Danube" Linz Airport lies about Script error: No such module "convert". southwest of the town centre, in the municipality of Hörsching. Direct flights include Frankfurt, Düsseldorf and Vienna with additional seasonal routes added during the summer and winter months. Ryanair flies to London Stansted Airport and Air Berlin flies to Berlin-Tegel Airport. The city also has a central railway station (German: Hauptbahnhof) on Austria's main rail axis, the West railway, linking Vienna with western Austria, Germany and Switzerland. There are also varying types of river transport on the Danube, from industrial barges to tourist cruise ships. The newspaper Oberösterreichische Nachrichten has its head office in Linz. The main street "Landstraße" leads from the "Blumauerplatz" to "Taubenmarkt" (Pigeonmarket) near the main square. In the middle of the main square the high "Pestsäule" ("plague column", also known as "Dreifaltigkeitssäule" (Dreifaltigkeit means Holy Trinity)) was built to remember the people who died in the plague epidemics. Gugl Stadium, is home to the LASK (Linzer Athletik Sport Klub), which is claimed to be the third oldest football club in Austria. As many central European cities, the cityscape of Linz is characterized by small and several sacred buildings. The Mariä Empfängnis Dom or New Cathedral, Linz is the biggest church in Austria, not by height (it is roughly 2 metres shorter than the St. Stephen's Cathedral (Stephansdom) in Vienna), but by capacity. The historic centre is characterised by its medieval architectural style, whereas in those parts of the city that border with the historic centre the architecture is of neoclassical, neo-baroque and neo-renaissance styles. Even further from the historic centre there are living areas, such as Franckviertel, Froschberg, Bindermichl and Kleinmünchen southern of the Danube and Alt-Urfahr northern of the Danube. These areas are where residential buildings can be found that are still referred to as "Hitlerbauten" or "Hitler buildings", because they were built during the interwar period and the time of Nazi dictatorship. The residential area called Gugl became a well liked living area among the wealthy at around 1900, which is why there are numerous villas still there today. Amongst the newer buildings is the new Central Station, which was designed by Wilhelm Holzbauer and added the Terminal Tower skyscraper as part of a mixed-use complex. Between 2005 und 2011 it was voted Austria’s most beautiful railway station seven times in a row by the Verkehrsclub Österreich. The Wissensturm ("Tower of knowledge") with a height of about 63 metres, houses the public library and the Volkshochschule, an adult education centre. It was designed by Franz Kneidinger and Heinz Stögmüller and opened in 2007. The Lentos Art Museum, which opened in 2003, was designed by Zürich-based architects Weber & Hofer and the Musiktheater (music theatre), which opened in 2013, was designed by Terry Pawson. The city is now home to a vibrant music and arts scene that is well-funded by the city and the state of Upper Austria. Between the Lentos Art Museum and the "Brucknerhaus", is the "Donaulände", which is also referred to as "Kulturmeile" ("culture mile"). This is a park alongside the river, which is used mainly by young people to relax and meet in summer. It is also used for the Ars Electronica Festival in early September and the "Linz Fest", which takes place annually in May. In June, July and August the "Musikpavillon" is placed in the park where musical groups of different styles perform on Thursdays, Fridays, Saturdays and Sundays free of charge. On December 1, 2014 Linz was accepted into the international network of UNESCO Creative Cities (UCCN) as a City of Media Arts. Currently 69 cities worldwide are members of the Creative Cities network, which is divided into seven thematic categories: literature, film, music, folk art, design, media art and gastronomy. The title goes to cities which enrich urban life and successfully involve society in electronic art forms through the sponsorship and integration of media art. Seven more cities can call themselves City of Media Arts: Enghien-les-Bains, Lyon, Sapporo, Dakar, Gwangju, Tel Aviv-Jaffa and York. The recently built Lentos (2003) is a modern art gallery, presenting art from the 20th and 21st centuries. It is situated on the south banks of the River Danube. The building can be illuminated at night from the inside with blue, pink, red and violet, due to its plastic casing. The Ars Electronica Center (AEC) is a museum and research facility on the north bank of the Danube (in the Urfahr district), across the river from the Hauptplatz (main square). The AEC is a significant world centre for new media arts, attracting a large gathering of technologically oriented artists every year for the Ars Electronica Festival. The AEC museum is home to one of the few public 2D CAVEs in Europe. The City Museum Nordico houses an art collection as well as a historical and an archeological collection, all of which relate to the city of Linz. About 16.000 people visited the museum in 2013. The Upper Austrian Regional Museum (Oberösterreichisches Landesmuseum) has three main locations that focus on different aspects of the regional history: The Landesgalerie (regional gallery) exhibits modern and contemporary art, the Schlossmuseum houses archeological findings all of which retrace Upper Austria’s cultural history whereas the aim of the Biologiezentrum Linz-Dornach (centre of biology) is to retrace the region’s natural history with an exhibition of about 16 million objects (which makes it the second biggest museum for natural history in Austria). At the headquarters of the Upper Austrian art association (Oberösterreichischer Kunstverein) in the Ursulinenhof in Linz there are regular exhibitions of contemporary art. The Upper Austrian museum of literature (Oberösterrreischisches Literaturmuseum), the Adalbert Stifter Institute for literature and linguistics and the Upper Austrian house of literature (Oberösterreichisches Literaturhaus) all are situated in the StifterHaus, where Austrian writer, painter and educationalist Adalbert Stifter lived from 1848 to his death in 1868. The Upper Austrian forum for architecture (Architekturforum Oberösterreich) in the house of architecture (Haus der Architektur) attracts about 6,000 visitors annually. The forum organises lectures, exhibitions, conferences and competitions. The Upper Austrian open house of culture (Offenes Kulturhaus Oberösterreich, acronym: OK) is an art institution focusing on contemporary art. The Museum of Dentistry (Zahnmuseum) shows an exhibition of equipment used in dentistry from the early 18th century to the recent past. The Cowboy-Museum Fatsy presents cowboy culture, showing original pieces from the United States. The Brucknerhaus, a famous concert hall in Linz is named after Anton Bruckner. It is situated just some 200 metres away from the "Lentos". It is home to the "Bruckner Orchestra", and is frequently used for concerts, as well as balls and other events. It is also the venue of the "Linz Fest" which takes place annually in May as well as one of the venues during the Ars Electronica Festival in early September. In June, July and August the "Musikpavillon" is placed in the park where musical groups of different styles perform on Thursdays, Fridays, Saturdays and Sundays free of charge. The Musiktheater (music theatre) was opened in April 2013 and is considered to be one of the most modern opera houses in Europe. It offers five stages of varying sizes; the big hall ("Großer Saal") with 1,200 seats, the BlackBox with up to 270 seats, the BlackBoxLounge with up to 150 seats, the orchestra hall ("Orchestersaal") with up to 200 seats and another stage in the foyer ("FoyerBühne"). Performances at the Musiktheater include operas and typically Austrian operettas, ballets and musicals. The ensemble of the Landestheater (regional theatre) Linz used to perform musical productions as well as theatre productions at a venue located on the "Promenade" in the inner city of Linz (this venue is still referred to simply as "Landestheater"). Since the opening of the new Musiktheater, only theatre performances take place at the "Promenade" venue, whereas musical productions are shown in the Musiktheater. The Landestheater Linz is especially renowned for its theatre for young audiences called u\hof:. The Kapu is a venue for various contemporary music styles, such as hip hop, noise rock and crust and also houses a cinema and a recording studio. The Posthof is one of the biggest event centres in Linz with three rooms offering up to 630 seats or standing room for about 1,200 people respectively in the big hall. The programme focuses on contemporary art and covers concerts, theatre, cabaret, dance and literature. Artists from Linz are regularly invited in order to improve the local cultural scene; e.g. bands from Linz get the opportunity to play as pre-bands alongside nationally and internationally known artists. Altogether a total of about 250 events take place at the Posthof each year with a total number of visitors of about 80.000. The Stadtwerkstatt is an independent association for culture and was founded in 1979. Its headquarters is located in the Urfahr district on the north bank of the Danube close to the Ars Electronica Centre and serves as venue for music events and other artistic and cultural activities. Situated at the same address is the Stadtwerkstatt’s own Café Strom, a café/bar popular amongst young adults. Wolfgang Amadeus Mozart wrote his Symphony No. 36 (1783) in Linz for a concert to be given there, and the work is known today as the Linz Symphony. He reportedly also composed his Piano Sonata 13 in B flat while in Linz, although it was published in Vienna. The first version of Anton Bruckner's Symphony No. 1 in C minor is known as the Linz version. Anton Bruckner was born in Ansfelden near Linz and spent several years working as a conductor and organist in Linz, where he also started to compose. The first version of Anton Bruckner's Symphony No. 1 in C minor is known as the Linz version. 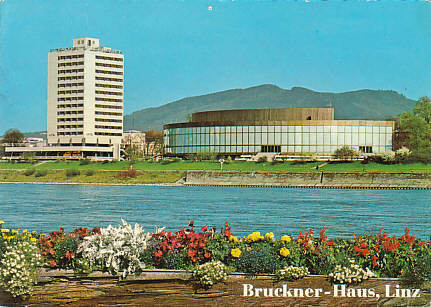 The Brucknerhaus, a concert hall in Linz as well as its annual international Brucknerfest are named after him. The musician and DJ Marcus Füreder, better known by his stage name Parov Stelar was born in Linz. Ars Electronica Festival: the Ars Electronica Festival is a festival for media art which has been taking place annually in Linz since 1986 and includes exhibitions, concerts, performances, symposia and interventions on changing themes that take place in public settings such as churches and industrial halls. The events focus on art, technology and society and the nexus among them. In 2013 a total of about 75.000 visitors took part in the Ars Electronica Festival. Bubble Days: the Bubble Days have been taking place annually in June since 2011 and are hosted by local creative collective LI.K.I.DO. During the event a number of extreme sports shows, such as aviation performances and a wake boarding contest, the Red Bull WAKE OF STEEL, take place in the harbor of Linz. Additionally there are a number of art exhibitions and live music acts and visitors can explore the harbor on boat tours, in paddle boats or kayaks. In 2013 the Bubble Days reached a total number of 12.000 visitors. Klangwolke (Cloud of sound): Created as a link between the Ars Electronica Festival and the international Brucknerfest, this open-air multimedia musical event takes place annually at the beginning of September at the riverside Donaupark in Linz. It is free of charge and attracted about 110.000 people in 2013. Today there are three different "Clouds of sound", the visualized Klangwolke, in which modern music (mostly commissioned works) is staged with lasers, video projections, fireworks, ships, cranes, balloons, etc., the Klangwolke for children (since 1998) and the classical Klangwolke. Linzfest: This Open Air Festival has taken place in Linz since 1990. It is financed by the city of Linz and several sponsors and organized for the broad public of all ages in cooperation with partners such as local cultural institutions. The festival is dedicated to a different theme every year (the last one in 2014 was "Old is the new new") and includes concerts, theater, dance, comedy, art in the public space, culinary art, literature and parties, all of which are in line with the general theme of the event. It is held in the "Donaupark", a wide park area next to the Danube, also referred to as "Donaulände" or "Kulturmeile". The Linz Marathon is held annually in April and attracted over 15.000 participants and about 100.000 spectators in 2013. Pflasterspektakel: The festival takes place annually since 1986 in the city center of Linz and includes musical acts, juggling, acrobatics, pantomime, improvisational theatre, clownery, fire dancing, painting, samba parades, as well as a program for children. With about 250.000 visitors (2014) the festival is one of the biggest street art festivals in Europe; its 28th edition featured 300 artists from 36 different nations. The Stadtfest (City festival) is held annually in August in the inner city of Linz. The three-day festival features live music acts of different styles, with each music style being represented on a different stage. The concerts are held by national and international artists. Every year about 100.000 people take part in this event. Urfahraner Märkte: These fairs are held twice every year (once in spring, once in autumn) in Urfahr on the northern side of the Danube. They include a fun park (with roller coasters and a Ferris wheel) and a market (with food products from local and regional farmers) and attract about 500.000 people. Kulturzentrum Hof: cultural institution featuring concerts of different music styles, cabaret performances, theater, readings and various workshops. The Kulturzentrum Hof tries to appeal to non-mainstream artistic styles. Landeskulturzentrum Ursulinenhof: The Ursulinenhof houses cultural institutions and is a cultural venue (presenting e.g. exhibitions and hosting readings and theater performances) and a press and event centre. University of Arts and Industrial Design Linz, public, for arts and industrial design (approx. 800 students). Linz offers many parks and holiday areas: Lakes and public swimming pools: Pichlinger See, Pleschinger See, Weikerlsee, Biesenfeldbad, Hummelhofbad, Parkbad, Schörgenhubbad. One of the first public swimming pools was the former “Fabriksarm”, a Danube branch stream (from Parkbad to Winterhafen) that was filled up in 1890. Afterwards a makeshift at the “Obere Donaulände” was built, which existed until a flood in 1954. In 1901 the “Städtische Schwimmschule” (city swimming school) was built at the place of the former Parkbad. Botanischer Garten: About 100,000 visitors are attracted by Botanischer Garten, which makes it one of the most visited sights of the City since 1952. Situated at Bauernberg, and comprising 4.2 hectares, the arrangement distinguishes by its harmonious design, its abundance of plant species (about 8,000 different types in culture) and the multifaceted cultural and event program. Donaulände or "Lände": public park on the Danube between Lentos and the Brucknerhaus. In summer, the Donaulände is a popular meeting point among young people living in Linz. It also hosts the Linzer Klangwolke. Freiberg: public park, very well frequented by families and joggers. One of the most beautiful residential districts of Linz. Pfenningberg: Pfenningberg is a part of the northeastern green belt directioning to Steyregg. It offers stunning views of the port facilities and the grounds of the VÖEST. Wasserwald: Big Park (approximately 1 km²) in the south of Linz. The park is located in the district of Kleinmünchen, where large waterworks are situated. The most frequent visitors are walkers, joggers, Nordic walkers and dog owner, who enjoy the idyllic atmosphere of the park. The park is equipped with well-maintained sidewalks, playgrounds, two toboggan hills, a fitness trail, a running track and a senior park with chess. Furthermore, two public restrooms are available. Stadtpark: On 22 August 2003, the new Linz City Park between Huemer- , Museum- , Noßberger- and Körnerstraße was officially opened. With 10,807 square meters of green area, it is the second largest inner-city park. The city of Linz has acquired this area due to a barter with the Austrian postal service. Since Schiller Park in 1909, there has been no newly openend park of this magnitude in the center of Linz. Landschaftspark Bindermichl-Spallerhof: In the first phase of the establishment of the 8.3 -hectare sized area, which reconnects the boroughs Bindermichl and Spallerhof, the province of Upper Austria was responsible for the expansion of the park. The park replaces the urban motorway, which runs subterranean in this area since 2006. Old paths were re-established and until mid 2007 city gardener designed prethe new parkland with 550 trees and various shrubs, perennials and flower beds that give the park a varied and beautiful boroughs appearance. Linzer Zoo: The Linz Zoo is located at Pöstlingsberg and is home to around 600 animals from 110 different species on Script error: No such module "convert".. In recent years, the zoo was able to increase its visitor numbers continuously. In 2014, about 132,000 visitors visited the Linz Zoo. Especially in densely built-up inner-city areas smaller parks are highly important for the inhabitants of Linz, the parks act as green oasises. Along the main axis of the city center of Linz, the highway, several such small gardens are located. These are on the one handside the Landhaus Park, which has been redesigned as part of an underground car park construction until 2009, whereby the old trees have been preserved. In Addition, Hessenplatz or – park is located in the city center of Linz. Hessenplatz was the center of Neustadtviertel in 1884. Just off the highway Schiller Park is located, which replaced the Trainkaserne in 1909, and the Volksgarten, which was created in 1829 by an entrepreneur and bought up in 1857 by the city. The EHC Black Wings Linz play professional ice hockey in the Erste Bank Eishockey Liga. Generali Ladies Linz is annual WTA Tour tennis tournament held in city. Andrew Edge (born in Leeds, England, 1956) musician. ↑ 2.0 2.1 "LINZ - UNESCO City of Media Arts" (in Deutsch). Retrieved 2015-01-10. ↑ Paul Hofmann (1987-04-05). "Letting Linz Castle cast a spell". The New York Times. Retrieved 2008-12-02. ↑ Lundy, Darryl. "A genealogical survey of the peerage of Britain as well as the royal families of Europe". The Peerage. Retrieved 2008-04-15. ↑ "Linz in Zahlen". Stadt Linz. Retrieved 2015-03-30. ↑ "Klimadaten von Österreich 1971-2000 -Linz" (in German). Central Institute for Meteorology and Geodynamics. Retrieved 2012-09-06. ↑ "LINZ AUCH IM KONGRESSBEREICH AUF ÜBERHOLSPUR" (in Deutsch). Retrieved 2015-01-29. ↑ "Tagungshandbuch 2014 web" (in Deutsch). Retrieved 2015-01-29. ↑ Press release Air Berlin. Retrieved 21 March 2011. ↑ Linz Linien GmbH for Local Transport. Linz AG. Retrieved 2010-08-29. ↑ "St. Martin's Church, Linz (in English)". Linz City Tourist Board. Retrieved 2008-04-06. ↑ "Mariendom (New Cathedral in Linz)". Mariendom. Retrieved 2008-04-06. ↑ "LASK". LASK. Retrieved 2008-04-06. ↑ George Tabori. "Mein Kampf: Farce in fünf Akten" (in German). Landestheater. Retrieved 2008-04-06. ↑ "Die Spielzeit 2007/2008". Landestheater. Retrieved 2008-04-06. ↑ "Welcome Posthof 04 2008". Posthof. Retrieved 2008-04-06. ↑ "Stadtwerkstadt". Stadtwerkstadt. Retrieved 2008-04-06. ↑ "Pflasterspektakel Festival". Magistrat der Landeshauptstadt Linz. Retrieved 2010-07-24. ↑ "European Capital of Culture". Linz Tourist Board. Retrieved 2008-04-06. ↑ "Creative Cities Network". Retrieved 2015-01-20. ↑ "Biologiezentrum Linz – größte naturkundliche Sammlung des Landes Oberösterreich" (in Deutsch). Retrieved 4 November 2014. ↑ "Musikpavillon im Donaupark, Nähe Brucknerhaus" (in Deutsch). Retrieved 25 September 2014. ↑ "Das Musiktheater am Volksgarten-Linz hat ein neues kulturelles Wahrzeichen" (in Deutsch). Retrieved 27 August 2014. ↑ "About". Retrieved 27 August 2014. ↑ "Posthof" (in Deutsch). Retrieved 27 August 2014. ↑ "Chronologie" (in Deutsch). Retrieved 27 August 2014. ↑ "Ars Electronica Festival – About". Retrieved 25 September 2014. ↑ "Ars Electronica Festival" (in Deutsch). Retrieved 25 September 2014. ↑ "Bubble Days – das etwas andere Linzer Hafenfest" (in Deutsch). Retrieved 4 November 2014. ↑ "CROSSING EUROPE Festival History 2004-2014". Retrieved 25 September 2014. ↑ "THE FESTIVAL OF REGIONS". Retrieved 4 November 2014. ↑ "Brucknerfest – The Idea". Retrieved 25 September 2014. ↑ "Festivals in Linz – Brucknerfest Linz" (in Deutsch). Retrieved 25 September 2014. ↑ "Mission Statement" (in Deutsch). Retrieved 4 November 2014. ↑ "Der 12. Borealis Linz Donau Marathon sprengt alle Teilnehmerrekorde" (in Deutsch). Retrieved 4 November 2014. ↑ "Pflasterspektakel 2014". Retrieved 25 September 2014. ↑ "Doug Hammond biog". Doug Hammond. Retrieved 2008-04-06. ↑ "Andrew Edge". Andrew Edge. Retrieved 2008-04-06. ↑ "Sister Cities of Linz". Retrieved 2011-10-27. 40x40px Wikimedia Commons has media related to Linz. 40x40px Wikisource has the text of the 1921 Collier's Encyclopedia article Linz. 12px "Linz". New International Encyclopedia. 1905.